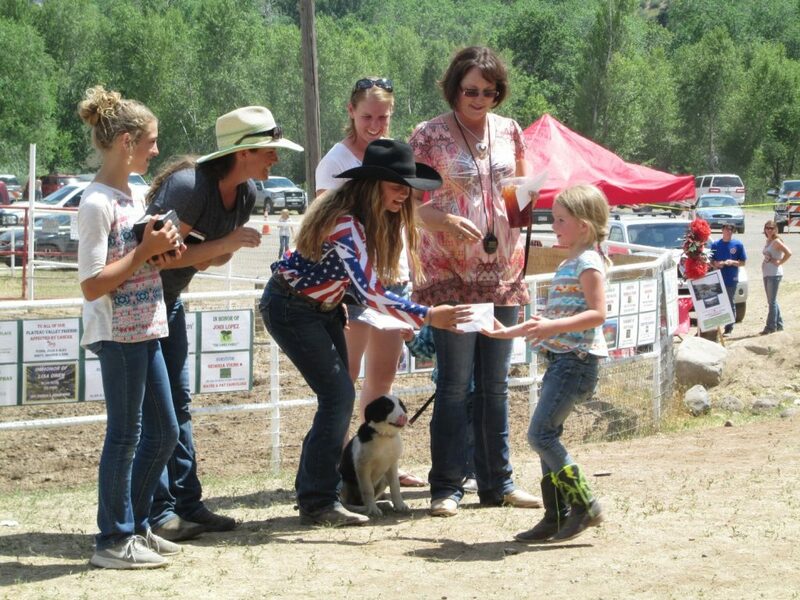 FAMILIES AT THE COLLBRAN ARENA GRANDSTAND WATCHED BULLRIDING AND PRIZES AWARDED THE AFTERNOON OF JULY 4. 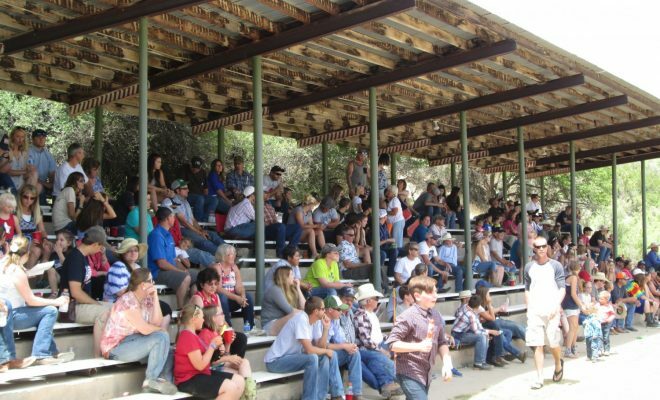 The crowds in the grandstand in Collbran on July 4th watched adult bull riding, calf riding and “mutton bustin” for ages 6 and under. Prizes include Tres Rios Belt Buckles, smiles, and applause. Three days of 4th of July events in Collbran included a street dance, a Gunfight on Main St., and a “Tough Enough to Wear Pink Night.” There was a pancake breakfast, a cowboy church, car show, and a Duck Race at the Grove Creek Bridge. Fireworks were at 9:30 p.m. The sun on the 4th was intense, but shade in the grandstand and refreshments helped. In the arena, the clown, dressed in red, worked to distract the bull after the rider landed on the ground. As trucks and cars left the dirt parking area at the arena in the afternoon, a sheep dog seemed to herd vehicles out. 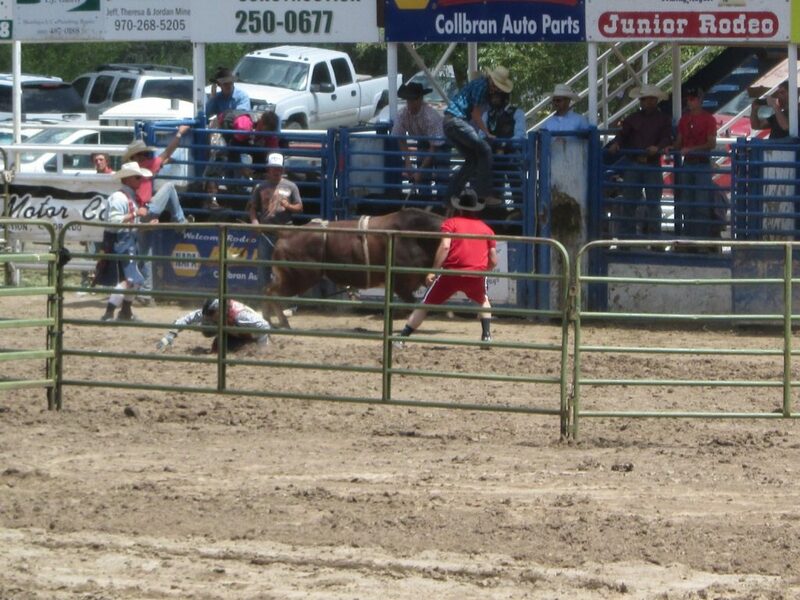 AS BULLRIDERS AT THE COLLBRAN ARENA LANDED ON THE GROUND, THE CLOWN, DRESSED IN RED, DISTRACTED THE BULL. RODEO PRIZES INCLUDED BELT BUCKLETS, AND SMILES AND APPLAUSE FROM THE GRANDSTAND. RODEO PRIZES WERE AWARDED IN THE AFTERNOON ON JULY 4.